This week Roadtrip-'62 ™ will take a quick look at some news about the supply of electricity in 1962 across the United States. We weren’t worried about global warming or carbon dioxide emissions back in 1962, so few “green” improvements to our electricity systems were made. The major change in air pollution sources of that time was in the coming use of nuclear power for electrical generation. A report from the Atomic Energy Commission (forerunner of today’s Nuclear Regulatory Commission) estimated that by the year 2000, nearly half of the United States’ electricity would be generated by nuclear power. The actual percentage was only about 20% by 2017, showing that the use of nuclear power was far too optimistically viewed back in 1962. They had good reasons though. For example, the first power generated by plutonium instead of uranium went online that year. This was a good development because it meant that low grade uranium and thorium ores not suitable for reactor use could be upgraded in existing reactors to a useable fuel, plutonium. Additionally, the nations first nuclear reactor operated by consumer-owned utility went online in 1962, at Hallam, Nebraska. It was one of eight plants began producing power that year; five of them constructed by the Atomic Energy Commission under their demonstration program. These included the Indian Point Energy Center in Buchannan, New York, which we passed on Day 6 of our US-6 roadtrip. Everyone was so smitten by atomic power that Con-Ed was drawing up plans for a nuclear reactor right in New York City! United States coal consumption, 1948-2008 (Public domain image from US Energy Information Administration.) Red line is electrical power generation, showing decline in recent years. But instead of nuclear power, burning coal has continued to be the largest source of our electricity. In 1960, we burned 176,685,000 short tons of coal for our power. Though we are declining from the peak use in 2007, we still use 664,749,000 short tons today, or close to four times as much coal as in 1960. Coal-fired plants currently produce about 30% of our electricity, with 32% coming from natural gas, about 7.5% from hydropower at dams, and other renewable sources providing 9.5%. I have said a lot more about coal on my "Ol' King Coal" page, so I won’t repeat it here. I could not find any evidence of wind or solar power for electricity generation, but one minor source of renewable energy was tapped in 1962; natural geothermal steam from geysers. 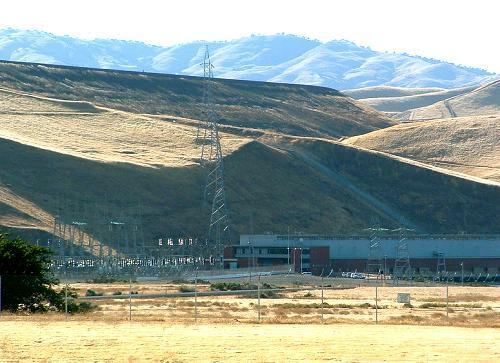 Pacific Gas & Electric had two plants in production in northern California. Hydroelectric generation was the only other major source of “green” power in 1962. Annual production of hydroelectric power reached about 190 billion kilowatt-hours in 1962, which is more than double the hydroelectric power production of 1950. This is because the two decades from 1951-1970 were the peak for completion of new dams in the United States. During 1962, 37 dams were completed, though not all were for electricity generation. Below is a sampling of the hydroelectric dams completed that year. The largest owner and operator of hydroelectric power plants in the United States today is the US Army Corps of Engineers. They oversee 75 plants with nearly a third of the nation's total hydropower output. The Corps of Engineers completed the Walter F. George Dam and Lake on the Chattahoochee River between the states of Alabama and Georgia. The lake is sometimes referred to as Lake Eufaula and extends 85 miles along the border. Highway US-82 crosses the lake on a causeway at Eufaula, Alabama, just north of the midpoint, and US-421 runs along the Alabama side. Heading north, the Tuckertown Dam was built by the former Carolina Aluminum Company on the Yadkin River in North Carolina to produce power for aluminum smelting. It is one of four dams in the Alcoa Yadkin Project, so named because Alcoa Aluminum took over from the former company. Alcoa Power Generation owns most of the land surrounding the lake, which is still mostly undeveloped. The site is about 6 miles east of US-52 from Richfield, North Carolina. Leesville Lake was constructed by the Appalachian Power Company on the Roanoke River in Virginia. It is a pumped storage facility, which actually uses power to pump water uphill to nearby Smith Mountain Lake during periods of low power usage. Then, during hours of peak demand, the power plant produces hydroelectric by normal downriver flow. Consequently, the lake experiences water level fluctuations of 1 to 10 feet per day! It’s located about 5 miles off US-29, southwest of Alta Vista, Virginia. Sebec Lake was completed Bangor Hydro-Electric Co on the Sebec River in Maine. This is a small facility, with a dam only 15 feet high and a generating capacity of 867 KW. In addition to providing some power, this dam provides an important barrier to invasive species, preventing them from reaching upstream areas. Peaks-Kenny State Park is on the south shore of the lake and is located about 30 miles west of US-2 from Howland, Maine and 35 miles east from US-201 at Bingham, Maine. It was still privately owned in 1962. Dams generally take a long time to build. San Luis Dam (also known as the B. F. Sisk Dam) in California began with a groundbreaking ceremony in August of 1962. It was not completed until 1968 and was filled for the first time in 1969. At the groundbreaking ceremony near Los Banos, California, 15,000 people gathered to watch President John F. Kennedy and California Governor Pat Brown give the signal that detonated the first explosive charges at the site. The dam is the largest off-stream reservoir in the United States, meaning that much of the water it holds is pumped in from streams that do not run through this valley. It is an example of a multi-purpose dam, with a main purpose of capturing and redistributing water for agriculture, and only a secondary purpose of electricity generation. San Luis Dam is unusual because it has another, smaller reservoir located directly in front of it, the O'Neill Forebay. Water from this reservoir is pumped uphill for storage behind San Luis Dam during periods of low demand and released to generate additional electricity during periods of high demand. Natural Gas was also a significant source of electric power generation in 1962, supplying about 25%. The major decline in power production has been in oil-fired plants, which accounted for about 33% of electricity in 1962 and almost none today. Oil just became too expensive to burn because it is used for so many other things, like our Roadtrip-'62 ™ journeys! See you next time on the road. 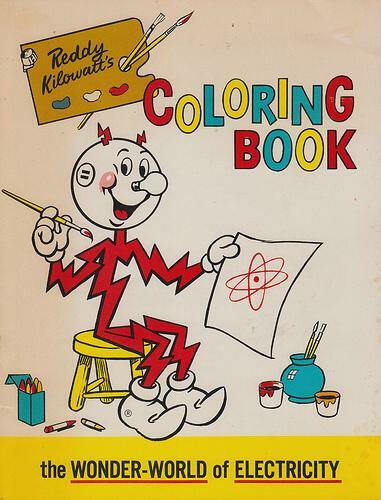 Reddy Kilowatt coloring book "The Wonder-World of Electricity", 1966. (Photo from Jordan Smith, The Cardboard America Archives, used by permission.) Reddy Kilowatt was the face of electricity throughout the 1950s and 1960s, often seen in promotional items from your local electric company.